Need your daily fix of free apps? We’ve handpicked 36 iPhone, iPad and iPod touch apps that are free today only. 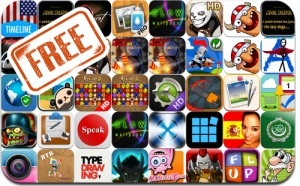 This apps gone free alert includes Gemz, Tread of the Dead, Land-a Panda, Flup, Gemz, Animator, Goal Defense, Battleground, Apocalypse Zombie Commando, TypeDrawing for iPad, Tiled, Effectly, and many others.